Levi’im Loving Second Session So Far! Second month started with such a bang, I’m not really sure what to do with my hands! I’m kinda nervous excited. But I’m jumping the gun—let’s go back to Thursday and we can catch up from there. WE WON SECOND PLACE IN ZIMRIYAH (Yavneh’s camp wide, 3-song singing competition) THIS PAST THURSDAY! OH MY GOODNESS!!!!!!! The chanichim (campers) were so stellar, so passionate, and so loud, which made us feel so stellar, so passionate, and so loud. We woke up Friday morning to pack up and have some free time, all the while feeling a little prouder of ourselves for our silver medals. 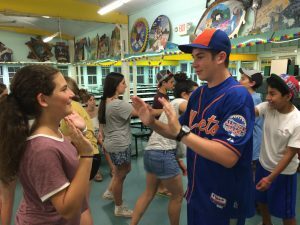 As Shabbat inched closer and closer to our camp and our bodies, we slowly shifted into a more comfortable state, almost out of a different age. We all gathered together for Kabbalat Shabbat (literally the reception of the Sabbath, the introductory prayers that we say on Shabbat) that lifted our spirits far higher than we ever thought possible. And for just a moment, we were no longer at Yavneh, conscious of the seconds passing before we would leave. We were in a different place and together in a different way. It was awesome. Saturday night post-Havdallah (the service that ends the Sabbath and begins the new Jewish week), the chanichim went to spend time with their Kerem (CITs and oldest aydah (age group) in camp) to make some final memories before leaving. Sunday morning was an early start, as parents arrived to take their kids for the day or until next summer. The goodbyes were tearful, full of sadness and joy. The tzevet (staff) rushed excitedly to get the camp ready for the chanichim to return. And return they did! Their enthusiasm was written all over their faces, and also on ours. Matching, we played some games to break the ice and get back into the groove of camp before going to a great dinner of pizza. Today, the chanichim are choosing their kitot (classes) as well as their chugim (electives), and spending some time in instructional swim. The afternoon will have some basketball and water games, as well as an exciting fear factor-themed night. Tune in this Thursday to hear how it went!! !